There is something for every reader in this collection. The eighteen stories are divided into sections, explained in the author’s entertaining foreword. The first section, “Ain’t it Romantic,” presents stories with an amorous, if somewhat twisted, bent. A model suffers humiliation from a pimple on her face that won’t stop growing no matter what she does, and discovers her photographer isn’t quite what he seems. A man trying to repair his broken marriage after an affair finds solace at library story time with his little boy until he notices a new mural that unsettles him. A broken-hearted widower goes back in time to spend time with his wife at meetings for grieving husbands. The old wives’ tale of a cat stealing a newborn’s soul starts off the “Joy of Parenting” section as a new father becomes convinced the stray cat he and his wife adopted has sinister intentions. A man risks his life traveling through a post-apocalyptic wasteland in which the effects of a bio-weapon turn exposed survivors into were-people. The author also includes a charming prequel to Jack and the Beanstalk. During the “Intermission,” we are given an explanation of why an airport bathroom exploded during a worker’s shift. The story is both funny and delightfully bizarre. History is touched on in the “Looking Back” section. The old adage “Everything happens for a reason” is played out in a chilling story in which a homeless man is convinced another street denizen is about to bring on Armageddon. A spurned lesbian pretends to be a man and joins the Union Army to fight the Confederates, and soon finds herself in a raid upon her former lover’s plantation. And two men discover a jackpot while mining for silver, but their riches are tainted by evil. And finally, the author looks toward the future in “Looking Forward.” A female pope saves the world, but is it faith or science guiding her? A man and his wife become caretakers for the man’s aging mother whose battle with Alzheimer’s begins to convince the man he is crazy once he starts experiencing the same hallucinations. 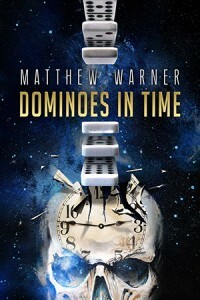 Matthew Warner is an impressive storyteller, and that skill shines through in this collection. While not exactly moralistic stories, quite a few of them leave you unsettled. 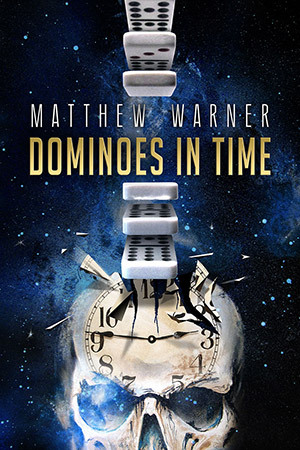 Dominoes in Time is a fantastic collection, and proves that the author should be front and center in dark fiction. Make sure you check out the Story Notes at the end; they are a fun read as well.